This is one of very common inquiries from SAP users. Function of Favorites of SAP GUI is very often used. The users like to use it as it is very easy to just put there transaction code which are not easy to remember. While there is a new SAP system or client where the user is getting account into he or she would like to have same most used or favorite transaction used available in the new system. Actually downloading or exporting of the favorites is supported within SAP GUI. Same it is with upload or import. 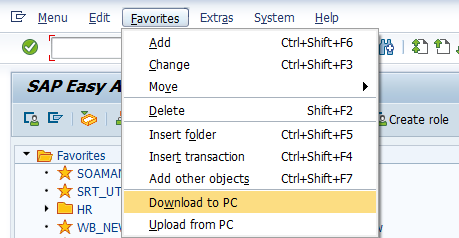 There is a function available in SAP GUI’s Favorites menu called “Download to PC” similarly to “Upload to PC”. great you found it useful! SAP Web IDE – what it is?